Amazonia free game is one of more than 400 free Games you can download at Free Ride Games, Amazonia is a captivating new Match Three game that will have you hooked right from the start. 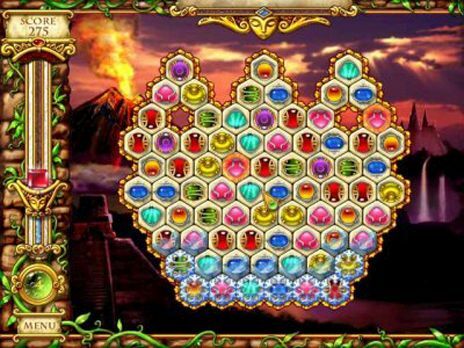 According to legend, there are six Spirits of the Elements hidden somewhere on the mysterious island of Amazonia The aim of the game is to collect and assemble these Spirits in the Forbidden Palace. If you succeed, you will receive the Seal of Unity, which will unlock a chamber filled with unimaginable treasures. The colorful graphics, animated backgrounds and electrifying bonuses of Amazonia make for truly entertaining and addictive gameplay! Download Amazonia now for FREE and enjoy: * Amazing graphics and sound * Seven thrilling stages * 80 challenging levels * Four valuable bonuses Free Ride Games is the only place where you can download over 300 top games for free, including Hidden Object games, Time Management games, Match Three games, Sports games, Puzzle games, Arcade games, Card games, Board games, Flash games, Fashion games, Food games, Online games, Word games and many more. We have hundreds of choices from the leading game publishers like iWin, PlayFirst, Sandlot Games, Mumbo Jumbo etc. Download Amazonia free game and play it now.